ISLAY: A report of a Common Sandpiper nr Loch Gorm yesterday (Louise Muir per Ian Brooke). MID-ARGYLL: Many small groups (2 -14) of Lesser BB Gulls now being seen inland N of Lochgilphead. Around the Moine Mhor – 18 Pied Wagtails in a loose group nr Poltalloch also 1 Lapwing, 160 Common Gulls and 80 Rooks there. 25 Fieldfares and 44 Skylarks at Ballymeanoch, 34 Teal, 76 Jackdaws at Ri Cruin and a single Woodcock on the Moine Mhor moss road (Jim Dickson). MULL: Another sighting of the Red-necked Grebe off Pennyghael today – closer but poor light (Steve Hiscock). 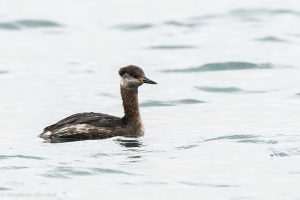 Red-necked Grebe – Loch Scridain, Mull 15th Mar (Steve Hiscock).